Used Volkswagen Up Review - 2012-present | What Car? 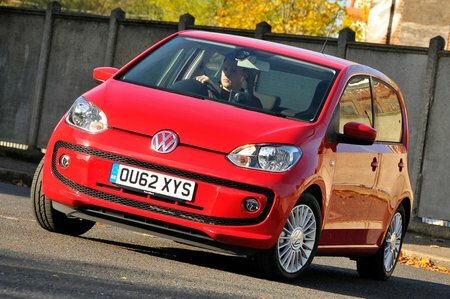 What's the used Volkswagen Up hatchback like? 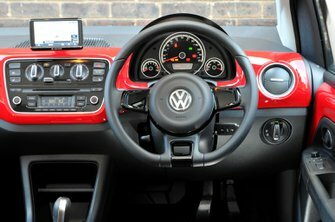 The best thing about the Volkswagen Up is that it doesn’t feel like a small car, not in the way it drives, the material choices of its interior or from the supremely supple ride. It’s only when you get out of it and see how much space is left over in a standard parking space that you realise you’re in a bantam Volkswagen. The Up has taken a lot of the design elements of the Toyota Aygo, but given them a Germanic spin by combining it with the quality of the Volkswagen Golf. Somehow, during this process, it has managed to create a very stylish car with an identity all of its own. The Up is quite cute; with big, bug-eye headlights, tiny 15 inch wheels which are pushed out each corner, and a boxy rear end with a neat glass hatch that sports an oversized badge. The other thing the Up has copied from the Aygo is its four-seat layout. While that does mean that those travelling in the back are less squished together, alternatives such as the Hyundai I10 and Suzuki Celerio are more practical because they offer a third belt in the rear, and would be better choices for those who need a five seat car. But then the Up manages to be both really good fun to drive, yet remarkably smooth riding. This is partly helped by the smaller wheels on offer, but also by the high levels of grip the car manages to achieve. The controls are a pleasure to use; the steering is light but precise, and the gearlever and clutch action is easy to bond with. Steering is untaxing, perfect for low-speed maneuvers such as parallel parking. But it weighs up nicely during high speed cornering, inspiring confidence in the the Up’s chassis. Despite how polished the overall package is, the Up’s residual values haven’t been quite as good as those from rivals. However, it is more costly to buy than its closest rivals, the Seat Mii and Skoda Citigo, and you’ll have to justify to yourself whether or not you are willing to pay extra for the nicer finishing touches of the Up.